by the great 20th Century teacher Swami Chinmayananda. Go to http://www.chinmayauk.org/home.htm to learn more. clearly experienceable in the cave of the heart. that which is the Fourth plane of consciousness. I am that Brahman, I am not this assemblage of matter. are free from sense cravings, and are desirous of liberation. discipline, knowledge of the Self is the one direct means of liberation. as light destroys deep darkness. the sun when the clouds pass away. nut settles after it has cleansed the muddy water. unreality of the dream is understood. the substratum, the basis of all this creation, is not realized. It is like the illusion of silver seen in the mother-of-pearl. just as gold is the single source of different gold ornaments. accumulated result of past actions (karmasancitam). another. This is the subtle body, the instruments of experience. (that is our intellectual life, mental superimpositions, desires). and Anandamaya Kosha, the sheath of bliss or joy-within-this-life). separates the rice from the husk, bran, etc. that cover it. acts as a mirror to reflect the Atman. beyond the limits of prakrti, is the witness to their functions. is observed through the functions of the sense organs. on the light of the sun. qualities, it is Absolute-Existence-Knowledge alone. to the mind) are misunderstood as the nature of the Self (Atman). not to the the Atman. and the thought wave of the intellect there arises the notion of "I know." he is himself the seer and the knower. the limited, ego-centered small self. illumine themselves because they are inert. the Atman, which is knowledge itself, needs no other knowledge to know it. and the supreme soul is realized. from the body and other perceived objects. for I am without the sense organs. I am other than the mind and hence I am free from sorrow, attachment, malice, and fear. 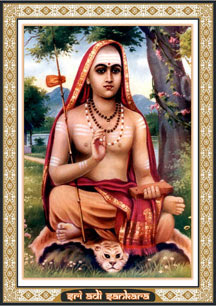 (nirakarah), ever liberated (nitya muktah), pure (nirmalah). I am pure, unattached, stainless, and motionless. infinite, supreme knowledge is my very nature. the agitation caused by it. The mantra is the best medicine against this ignorance. with unswerving attention on the Atman. the Atman, until the Atman alone remains. Know this Atman as stainless like the pure sky. up all the spiritual ignorance within us. ornament which was all along hanging from the necklace around your neck. is destroyed when the real nature of the jiva is realized as the Self. confusion about the location of east and west. everything in the universe as nothing but his own Self. the enlightened soul understands that all it perceives is the Self. and he happily relinquishes his attachments to illusory, external happiness. contemplative one remains unconcerned and free from attachment to them. space into space, light into light. desired, and the knowledge of which leaves nothing more to be known. known leaves nothing else to be known. and below and all that exists in-between. Brahman as the solitary and immutable substratum of the universe. and enjoy in proportion their share of that particle. therefore Brahman, unseen, permeates everything as butter permeates milk. without birth or change, without form, qualities, color or name. but which is not illuminated by their light, realize that to be Brahman. itself like the fire that permeates a red hot iron ball and glows by itself. object other than Brahman appears to exist it is unreal like a mirage. reality one sees the universe as the Non-dual Brahman, Existence-Knowledge-Bliss. attachment to the body, will not see the Atman. 'OM,' and shines of itself like gold. and all-pervading and attains, thereafter, immortality.